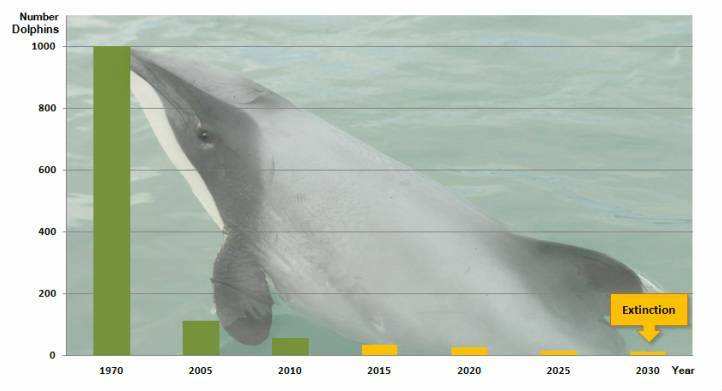 Small, lesser-known species of cetaceans, such as the baiji (or Yangtze River dolphin) may not survive the next decade. 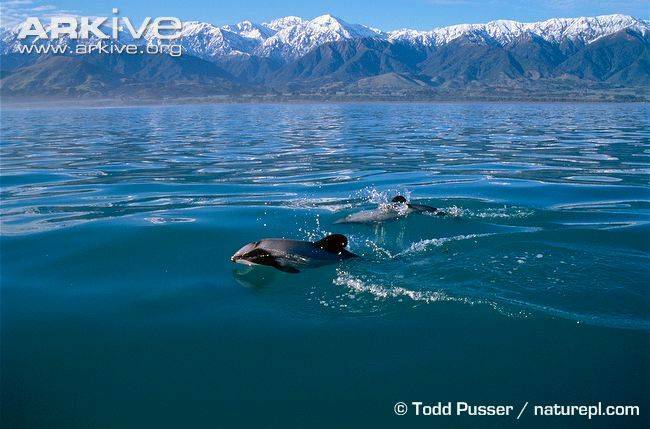 The same holds true for Hector’s Dolphins (Cephalorhynchus hectori) and Maui’s Dolphins (Cephalorhynchus hectori maui) in New Zealand. 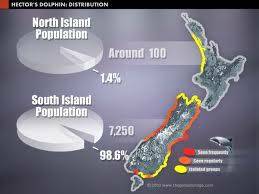 In New Zealand’s case, three international scientific bodies have repeatedly urged the New Zealand Government to protect the world’s smallest and rarest dolphins from extinction. But the calls by the International Whaling Commission (IWC), the International Union for the Conservation of Nature (IUCN), and the Society for Marine Mammalogy (SMM) have not been heeded. 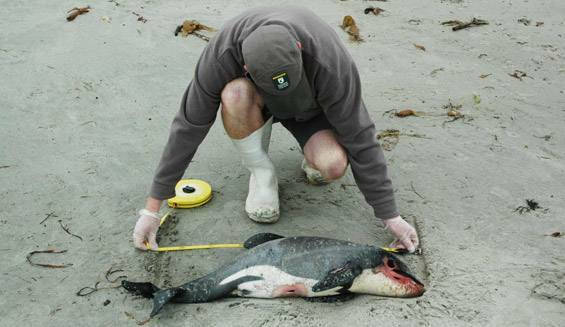 Recently the SMM, the pre-eminent body of international marine mammal scientists, issued its third appeal to the Government, stating that any further fishing-related deaths are unacceptable if Maui’s dolphins are to survive. 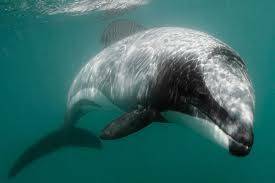 The Society’s letter follows the announcement of proposals to slightly increase protection for Maui's dolphins, and the death of a Maui’s dolphin on the 13th September. 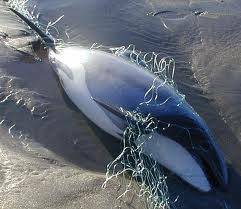 Fishing with gillnets and trawling poses the most serious threat to the dolphins’ survival. 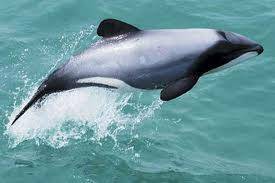 Forty years ago there were an estimated 1,800 Maui dolphins. Today there are just some 46 individuals aged one year and older. 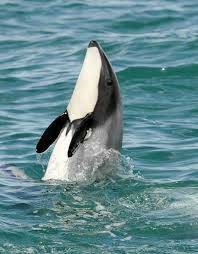 Because the population is so small, Maui’s dolphins can only survive a single death at human hands every 10 to 23 years. 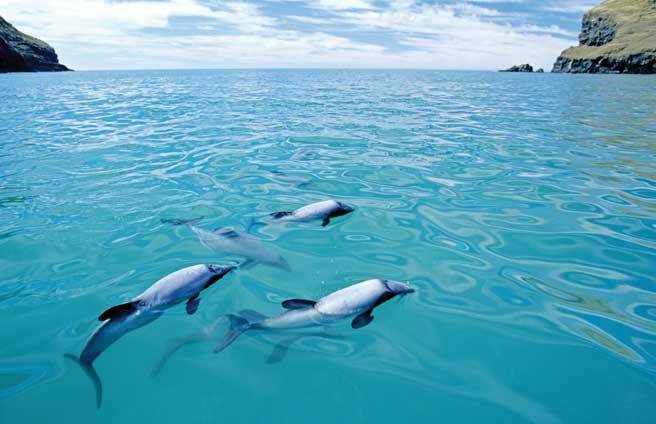 Fishing is the greatest threat to both Maui and Hector’s dolphins, with specialists affirming that only a ban on fishing in their coastal habitats can avoid their extinction. There are currently 86 recognized cetacean species. These animals live in a variety of habitats, from the high seas far beyond the national jurisdiction of any country, to the shallow freshwater rivers, lakes and coastal waters of southern Asia and South America. Some species are highly migratory, requiring vast areas of ocean to move between feeding and calving waters, whilst others reside in particular sections of rivers and coastal waters. The world’s leading independent scientists, including those from the International Whaling Commission, the International Union for the Conservation of Nature (IUCN), and the Society for Marine Mammalogy agree that harmful fishing methods must be banned across the dolphins’ range if the species is to have any chance of bouncing back. But the New Zealand government is ignoring these urgent recommendations. Instead, the government’s proposed plans provide a piecemeal approach to their protection, which is out of step with what is required to facilitate recovery. 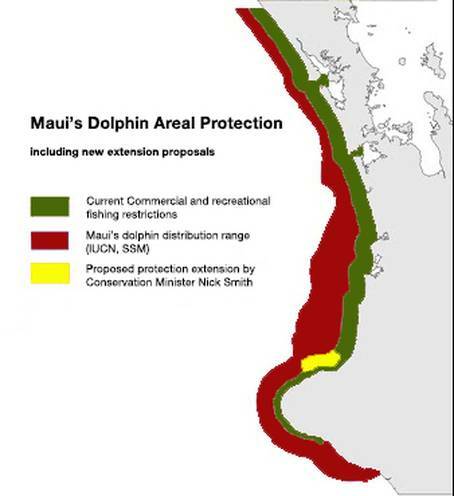 But Maui’s dolphins can’t survive with these threats much longer. 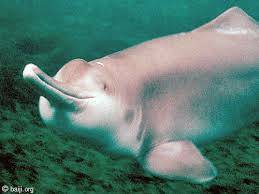 The Baiji ((Lipotes vexillifer) is a graceful freshwater dolphin, characterized by a very long, slightly upturned beak and low triangular dorsal fin. Like other river dolphins, it has little need for vision in the muddy waters it inhabits, and as a result has tiny, barely functional eyes. It is pale blue-grey in color with a white underside. The female is generally larger than the male. Group size is usually small (four or five animals), although aggregations of up to eleven individuals have been seen in areas of abundant prey density. Sightings over the past 15 years have been extremely infrequent, typically of pairs or solitary individuals, reflecting the species' precipitous decline. Baiji feed in the early morning or during the night. There is evidence to suggest that baiji movements are linked to seasonal changes in water level, with individual baiji travelling up to several hundred kilometers upstream and downstream. Females reach maturity at eight years and give birth to one young approximately every two years. 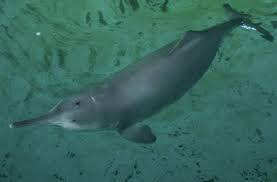 One captive male baiji, 'Qi Qi', survived in the Wuhan dolphinarium for over 22 years. The dolphins are not heavily scarred and there is little evidence of aggressive interactions either intraspecifically or with finless porpoise (Neophocaena phocaenoides asiaeorientalis), the other small cetacean present in the middle-lower Yangtze. Typically found in confluences (where rivers or streams converge with the main Yangtze channel) and around sandbars with large eddies, where fish are more abundant. Endemic to the Yangtze Basin in eastern China. 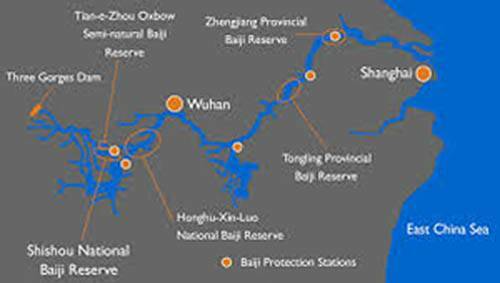 The species has recently only been recorded from the 1700 km stretch of the middle and lower Yangtze River between Yichang and Shanghai; this historical distribution has always been downstream of the site of the Three Gorges Dam project. Until the 1950s the species was also present in the Qiantang River.